The idea of eating cake for breakfast appeals to me. It’s easily transportable, there’s no need for refrigeration, you can eat it on the go, it seems a wee bit French and that sugar rush should sustain you for at least one hour after shoving it in your gob. So many pluses! Sadly, in reality, eating cake for breakfast probably isn’t an ideal way to start the day (insert frown emoticon). 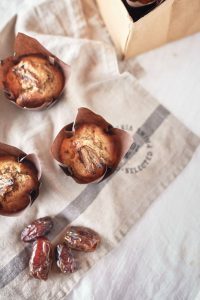 But don’t despair, I’ve created a muffin that’s basically made out of ingredients you might find in your bowl of morning porridge, baked it and turned it into a legitimately healthy snack you can enjoy at any time of day. That means I can now have my cake and eat it for breakfast too! Hurrah. 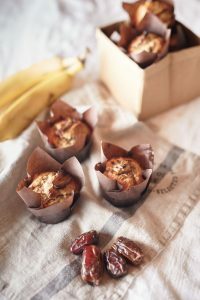 This recipe also makes use of those unsightly rotting bananas you have sitting in your fruit bowl that you are considering chucking in the bin. Don’t pretend you don’t have them, everyone does. If you are not really in a baking mood, you can freeze over-ripe bananas in their skins to use when you are. To make this recipe gluten free or paleo friendly, you can swap out the oat flour and just use almond meal. By the way, oat flour sounds like something really fancy and unattainable for purchase at your average supermarket but it’s simply whole rolled oats blitzed in a blender or food processor for less than 30 seconds, it whizzes up into flour so quickly and it’s a cheap source of ‘super food’ nutrients. You could also try using pumpkin puree (about two cups of steamed pumpkin mashed up) instead of banana, it kind of turns out into more of a pumpkin scone as it’s more dense, but it still has that nice savoury but sweet thing going on that I do adore when using pumpkin in baked goods. Takes about 10 minutes to mix together and 20 minutes to bake. I’m bad at maths, but this should take you 30 minutes from conception to completion. Boom! Grab a large mixing bowl, add your bananas and mash well with a fork until smooth. Crack in the eggs and add in the vanilla, maple syrup or honey, medjool dates, almond meal, oat flour, spices, baking powder, coconut milk and salt. Give it a good mix until combined. 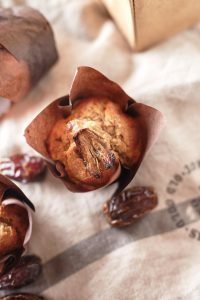 Divide the mixture between your muffin cases, garnish with sliced medjool date and bake in the oven for 20 minutes. I like to eat these warm so do try one when they come out of the oven!